The Philippine Republic's Region III, Central Luzon, comprises seven provinces: Aurora, Bataan, Bulacan, Nueva Ecija, Pampanga, Tarlac and Zambales, in central Luzon island. The flag appears to be a white version of Jaume Olle's image (below), but with different text in the ring. The Philippine Republic's Province of Aurora is as small and thinly populated as Quezon is large and populous. It is located just north of Quezon on the east coast of Luzon, known to the Spanish as the "contra costa." Its population is 173,000 in eight towns. Aurora is named for Aurora Quezon, the wife of President Manuel Quezon of the Commonwealth of the Philippines; both were born in the capital town of Baler, now apparently renamed Naval. The Catholic church of the town was defended by four Spanish officers and fifty men for nearly a year, June 1898 to June 1899, and was the last Spanish outpost in the Philippines to surrender. The Filipinos admire this heroic defense, and have set up a monument to it. 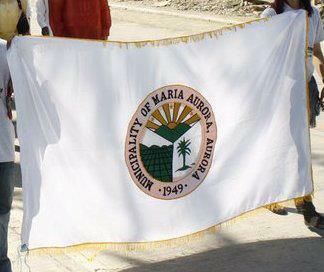 Aurora became a sub-province of Quezon in 1951, and a full province in 1979, so the image above is very likely obsolete. Aurora is heavily forested, and the cleared land is used mostly for farming; there seems to be no industry. The province is exposed to Pacific typhoons, and is hit by an average of four per year, some of devastating severity. On the other hand it is a fine place for surfing, as well as scuba-diving and snorkeling, though local support services are not readily found. It also has dramatic scenery on the side of the mountains. The principal products are copra, rice, banana, coffee, pepper, and citrus, plus various wood products and fish. There is some cottage weaving, and the provincial government is trying to develop food-processing and wood-processing industry. 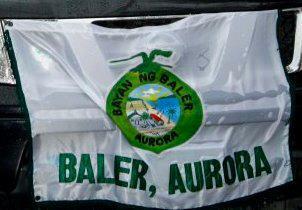 Aurora was transferred to Region III by Executive Order No. 103. Bataan is in the Central Luzon Region of the Philippine Republic, occupying a peninsula that forms the northern enclosure of Manila Bay. A narrow channel separates it from Corregidor. Most of the province is still given over to farming and fishing, with the surplus of both going across the bay to feed the ever-hungry capital. Bataan is taking advantage of its position on Manila Bay to develop international and domestic port traffic and various industries. It also has plenty of beaches, mountain streams, etc., and hopes to encourage tourism. Bataan, with 558,000 inhabitants, is the least populous province in the region. After the Japanese invaded the Philippines in World War II, Bataan was the last stronghold of the American and Filipino forces in the archipelago. Eighty thousand of them held out in Bataan for four months, hoping for a relief by sea that America was never able to send. Their supplies eventually failed, and a renewed Japanese assault compelled their surrender on April 9, 1942. Corregidor surrendered a month later. The prisoners were marched off to internment camps. Many, weakened by months of privation, were unable to keep up the pace, and were killed out of hand, to the number of ten thousand. This Bataan Death March was an early subject of the Asian War Crimes Tribunal. Bataan bears famous monuments to this heroic but doomed defense and to the victims of the Death March, plus another erected many years later by the Japanese to international peace and friendship. Bulacan is the most populous province in Region III, with 2,230,000 inhabitants as of 2000, and apparently accomplished the remarkable feat of increasing its population by twenty-five percent since 1995. Its area is 2638 sq.km., divided into twenty-four towns, of which five share a modest coastline along Manila Bay. The capital is Malolos. The province's name derives from a native word referring to the many and various flowers, including many kinds of orchids. The land slopes upward to the east, where Mount Oriol is the highest peak. Both Pampanga and Bulacan took leading parts in the last rebellion against Spain and the first Philippine Republic. Bulacan has a mixed economy, agricultural and industrial. The principal crops are rice, sugar cane, maize, melons, vegetables, and bamboo. Industries include food processing, leather tanning, textiles, shoemaking, ceramics, chemicals, metals and machinery production. Handicrafts are also practiced, and there is much fishing, both fresh-water and salt-water. The province of Nueva Ecija is the biggest in Central Luzon, well over 5000 sq.km. Its population is 1,614,000 by the 2000 census in twenty-nine towns and three cities, Palayan (the capital) with 31,000 inhabitants, San José with 107,000, and Cabanatuan (always spelled with a C except on its flag) with 218,000. 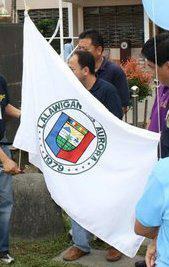 Nueva Ecija is overwhelmingly agricultural, as appears on all four flags. It is known as the breadbasket of the Philippines. The soil is apparently so rich that it will grow anything planted in it. Central Luzon State University in Munoz and several other research institutions assist in agricultural development; the province apparently does not aspire to industry except as adjuncts to agriculture (food processing, for example). When Nueva Ecija was created in 1705, Governor Cruzar named it after his native place, Ecija (Écija), in Seville province (Andalusia, Spain). The Philippine Republic's Province of Pampanga has 1,727,000 inhabitants by the 2000 census; it comprises the City of Angeles (pop. 243,000) and twenty-one towns, San Fernando being both the provincial and the regional capital. Its area is 2,171 sq.km. Pampanga was founded in 1571, covering the whole of Central Luzon; all the other provinces have been set off from it over the centuries. It is almost landlocked, but has an extensive riverine network centered on the Pampanga River. Mount Arayat National Park, in the town of Arayat near Angeles, is managed by the provincial government. The early inhabitants apparently came in several waves from Java. They still speak a distinct language. Before the Spanish arrived the Kampampangans practiced irrigation, grew rice and sugar cane and fruit trees and fiber and ornamental plants and spices, wove useful and attractive fabrics, smelted metals and made tools and jewelry, wrote their language with a syllabary, and had a written code of laws. Farming and fishing are the main economic activities; Pampanga still grows rice and sugar cane, also maize, fruits, vegetables, melons, and root crops. The Pampanga River and commercial fishponds yield carp, crabs, and shrimp. Pampanga Agricultural College is located in Magalang. Woodcarving, furniture-making, lantern-making, ceramics, and other crafts are also widely practiced. The oldest vocational school in the Far East is in Bacolor. Clark Air Base and two other American military bases were located in Pampanga, and their structures still stand, now constituting a special economic zone. During World War II the Japanese had a kamikaze base in Pampanga, and there are memorials to the kamikaze pilots. Continuing through Region III on the basis of least populous province to most populous brings us to Tarlac, population 1,045,000 by the 2000 census on 3,053 sq.km. divided into seventeen towns, of which Tarlac is the capital. There are no cities. The province is landlocked and mostly agricultural. The easternmost soil zone is the biggest, well-drained soil that grows rice, sugar cane, maize, tobacco, and some minor crops and livestock. To the west this soil gives way to clay, challenging for agriculture but useful for ceramics and bricks. Westernmost is the Zambales range, forested, yielding some woods (which get turned into furniture and wooden clogs) and home to some more of the Aeta. Tarlac contains the place of internment for the survivors of the Bataan Death March, and a large monument salutes their sacrifice. North up the west coast of Luzon from Bataan is the province of Zambales, which, with 623,000 by the 2000 census, is the second least populous, but at 3,714 sq.km. it is about three times as big as Bataan. 194,000 of these live in the city of Olongapo; the rest are divided among thirteen towns. Iba is the capital. Like Bataan, Zambales is overwhelmingly agricultural. Its principal products are maize, rice, sugar cane, vegetables, poultry, and swine. The inhabitants also practice various handicrafts for sale. There are also three large mining operations, concentrating on chromite, though Zambales also has reserves of gold, iron, nickel, and other resources. Zambales is very diverse ethnically, having surviving populations of Aetas, apparently the earliest inhabitants, who still practice their hunter-gatherer life without fixed abode in the mountains, and Sambalis, for whom the province was named. It is also the location of Subic Bay, where the Spanish in 1895 built a navy base that passed to the United States a few years later. It was destroyed by the eruption of Mount Pinatubo in 1991, and a Philippine Free Port was then built on the bay. Zambales is also working to develop its tourist potential; there is a marine life sanctuary offshore at San Salvador Island, and a variety of ecosystems inland, including the area recovering from Mount Pinatubo's eruption, plus many miles of varied shoreline.